The Zeil M2 is a prototype device that could warn you when you're about to pull a muscle. Wouldn't it be great if you could know that you're about to injure yourself moments before you actually do? A pair of students out of Rice University believe that they've developed a wearable that can do just that. 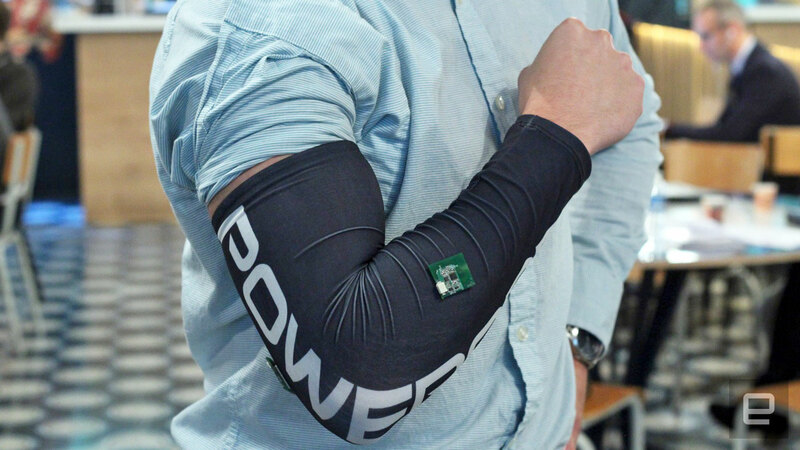 Ziel's M2 Sleeve is a prototype device that's designed for baseball pitchers to monitor the stress on their forearm. Using a combination of accelerometers, gyroscopes and muscle sensors, the unit can track motion and raise the alarm just before someone does some real damage. There are plenty of other established performance-monitoring devices that already do a similar job, but Ziel CEO Senthil Natarajan thinks that his firm has an edge. He believes that "coaches don't have time for a lot of needless data that they can't understand." Rather than bombarding people with reams of statistics about throwing speed, the company's deep learning tech will offer simple, useful advice in real time. That should enable coaches for, say, high school baseball, to hook players at risk of injury or leave pitchers on for longer if they're doing fine. Major League Baseball has shown extraordinary willingness in embracing technology, and issued a memo saying such earlier this year. As it stands, players can wear a Motus Sleeve for monitoring elbow stress as well as a Zephyr Bioharness for heart-rate monitoring. While the insights can't be used in real time, it seems like it won't be long before coaches will run games using a data-driven approach. The company is hoping to get the gear ready for consumers in time for the holidays in 2018 and will target high school baseball coaches first. The sleeve itself is expected to cost around $250, while a coaching subscription for each individual user will be priced at $10 a month. That subscription charge reflects the idea that these deep learning insights will develop over time, offering more granular insights the more it's used. It's not just baseball pitchers who could stand to benefit from this technology, however, as any repetitive motion can be analyzed by the technology. That could mean widening the circle to quarterbacks in football, soccer players and factory workers at risk from repetitive strain issues. The company will, however, have to make sure that it can offer a compelling alternative in what's becoming an increasingly competitive market.